CHICAGO – In this one-night only HollywoodChicago.com Hookup: Music, we have 5 pairs of reserved concert tickets up for grabs at the gorgeous City Winery concert venue to experience two rarely paired, female-fronted powerhouse rock bands: The Lauren Wolf Band and Danielia Cotton (in from NYC for this show)! Taking place right before Mother’s Day in this sit-down venue, you’ll have the opportunity to bring your loved one for a relaxing dinner, drinks and an unforgettable night of live music. Lauren Wolf and Danielia Cotton will be joined by an opening acoustic set from Simpleton & Cityfolk (a folksy, Mumford & Sons-like sound). This is an all-ages show! Our winners will be e-mailed on Monday, May 5 and must confirm their attendance within 24 hours. Lauren Wolf’s aggressive rock/blues vocals are often compared to Janis Joplin and Grace Potter. Her band is the 2012 Live Nation Battle of the Bands national winner (beating out 150+ bands across the country). The band is a 2012 and 2014 Chicago finalist in Hard Rock Rising, which is the largest battle of the bands in the world. Danielia Cotton has been named one of the “5 black artists saving rock music” (along with Gary Clark Jr. and Brittany Howard of Alabama Shakes). Didn’t win, but want to attend? You can purchase tickets here. To win your free City Winery Chicago concert tickets courtesy of HollywoodChicago.com, just get interactive with our social media widget below. That’s it! This concert takes place on Thursday, May 8, 2014 with doors at 6 p.m. and the show at 8 p.m. at City Winery at 1200 W. Randolph St. in downtown Chicago. The more social actions you complete, the more points you score and the higher yours odds of winning! Completing these social actions only increases your odds of winning; this doesn’t intensify your competition! 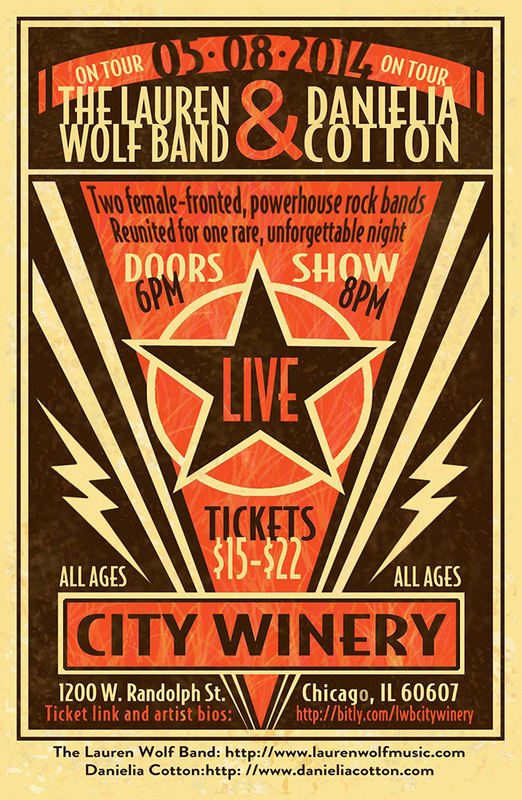 The poster for City Winery on May 8, 2014 with The Lauren Wolf Band, Danielia Cotton and Simpleton & Cityfolk. This HollywoodChicago.com Hookup is simple! Just get interactive in our Hookup social media widget above. We will award 5 pairs of concert tickets based on social entry numbers and/or randomly via e-mail for our City Winery Chicago Hookup. Good luck! HollywoodChicago.com works hard to coordinate our giveaways for you with the movie and TV studios as well as local entertainment venues. If you enter to win and are fortunate enough to be awarded, we expect you to attend. If you reply saying you can’t attend – or don’t show up at all without notifying us – that opportunity goes to waste and another lucky HollywoodChicago.com winner misses out on enjoying what you would have. We use various forms of tracking technologies to know whether or not you attended. When you win and don’t attend, reputation points will be counted against you and you’ll win less frequently. Please make sure you can attend if you win. Winners must confirm their attendance within 24 hours when awarded. These concert tickets are for reserved seats. Tickets will be available at will call. Winners must present a photo ID at the show for ticket redemption. HollywoodChicago.com LLC is a promotional partner with the venue and does not assume any liability for this giveaway. HollywoodChicago.com is not responsible for errors or omissions entered in user submissions. Comments are closed in this Hookup.